For the first time ever in a UK referendum, the electorate on 23 June 2016 rejected the status quo, the advice of the government and the consensus of Parliament. The Brexit vote divided the country and pitched ‘direct democracy’ against ‘Parliamentary democracy’, with potentially disastrous consequences. This was demonstrated on the BBC's Andrew Marr Show last Sunday where there was a clash between Supreme Court campaigner, Gina Miller, and influential Conservative commentator, Tim Montgomerie. 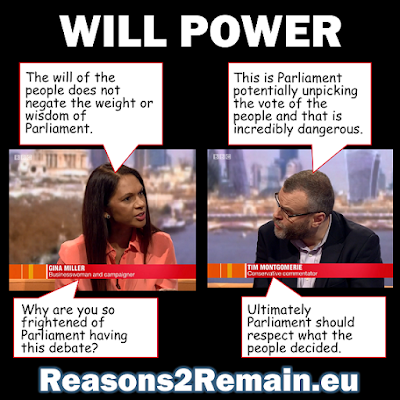 Gina Miller proposed that Parliamentary sovereignty should take precedence over the referendum vote, whereas Tim Montgomerie argued the 'people's vote' should take priority over Parliament. It was because of Ms Miller’s legal action that the Prime Minister, Theresa May, had to back down on her plans to pass Brexit by bypassing Parliament, using the arcane 13th Century Royal Prerogative. Both the High and the Supreme Courts ruled that such a course of action would be illegal. Subsequently, there is now a Brexit Bill passing its way through Parliament to give parliamentary authority for the triggering of Article 50, the formal notice required for the UK to leave the European Union. This week Ms Miller started a new campaign to persuade members of the House of Lords to pass an amendment to the Brexit Bill this week, to enable Parliament to have the final say on the final Brexit deal. Ms Miller said she’s worried that the upper house will bow to pressure from Mrs May and the media and pass the Brexit Bill without any amendments. On the Andrew Marr Show she explained, “The Lords needs to show backbone this week because the only reason these debates are happening is because of my case." And therein lies the problem now facing and fissuring Great Britain. Direct democracy (referendums) and representative Parliamentary democracy can be dangerously incompatible. They cannot co-exist without the potential of one damaging or even destroying the other. The few referendums that Britain has held in the past few decades haven’t caused a problem because, until now, every single referendum returned a result in accordance with the status quo and the will of Parliament. So there was no clash; there was consensus and harmony. But now things have changed, dramatically and perilously, since the UK's EU referendum of June 2016 opted for Brexit, against the government's strong recommendation - and that of most MPs - that the country should vote to remain a member of the European Union. For the first time ever, ‘the people’ have voted in a way that’s the complete opposite to the will of our Parliament. So which ‘will’ has superior sovereignty: Parliament, or 'the people'? The conflict has the potential to destruct the very core of our democracy. This is a problem that has never happened before in Britain, but it should have been anticipated. After all, referenda are a relatively new phenomenon in our country, and many sage British politicians were, for good reasons, completely against them. And it’s true: Hitler, Mussolini and Napoleon III all used referendums to legitimise decisions they had made. They could go to the populace and ask them any question, and then interpret the simplistic one-word answer almost anyway they wanted. (Which is pretty much what our new Prime Minister, Theresa May, and her unelected administration, are attempting to do right now). Of course, David Cameron knew the dangers of referendums all along. But he never anticipated losing. No government had ever previously lost a referendum. Since Mr Cameron was convinced that there was almost no chance of losing, a potential clash between the ‘will of the people’ and the ‘will of Parliament’ was not going to occur. How wrong he was. What’s worse is there was no need for a referendum at all. Mr Cameron only decided to hold one to resolve an internal dispute in the Tory party, and not in any shape or form for the national interest. Euroscepticism, and the call for another EU referendum, had always been on the minority fringes of the main political parties, especially as around two-thirds of both houses of our Parliament strongly supported EU membership. Mr Cameron not only gambled with our country’s future by holding an unnecessary referendum, but he also put into grave risk the foundations and established mechanisms of our traditional method of democracy. Now MPs and Lords feel stymied. The vast majority of their heads and hearts tell them that Britain’s best interests are served by remaining in the EU, and that Brexit is likely to cause the country severe economic hardship and isolation. After all, this is what most of them told us during the referendum campaign. 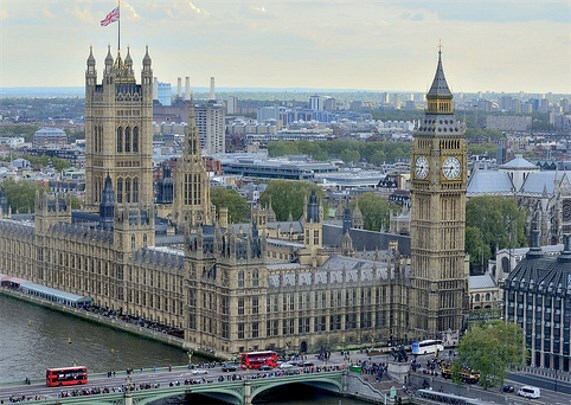 Instead of the referendum giving our Parliament more sovereignty – one of the many disingenuous promises of the Leave campaign – the referendum result has severely weakened and demeaned Parliamentary sovereignty and the function of MPs. Instead of empowering Parliamentarians, the referendum result has turned them into puppets of ‘the will of the people’ (which nobody can really define - especially since 17 million 'Leave' voters nowhere near represent a majority of the country's 65 million population). And unlike decisions of Parliament, which can be fully considered, amended, changed and reversed, the simplistic one-word answer of the Referendum appears to be cast in stone. Most Parliamentarians feel they are stuck with it, and can’t do anything about it, let alone undo it. This is a hopeless situation. The sooner we get back to fully fledged, representative Parliamentary democracy, that has served this country for hundreds of years, the better. The simple fact is that referenda are only benign when they agree with the will of Parliament. But when referenda return a result that’s entirely the opposite to the will of Parliament, our democracy, and our country, are in danger of tearing themselves apart..